Monday – Friday 11 a.m. – 7 p.m.
Saturday 11 a.m. – 7 p.m.
Sunday 11 a.m. – 6 p.m. Contact us to confirm what's on display and in stock at this store. Room & Board Washington, D.C. Enjoy two hours of free validated parking at Avenue Parking, adjacent to the showroom. Spaces are limited. Present your parking ticket to a Design Associate for validation. Parking is also available daily at 1820 14th Street, NW or weekends only at the Reeves Center at 2000 14th Street, NW (garage entrance on U Street, NW between 14th and 15th). Join us for store-hosted events! They're a great way to get involved with the local community, enjoy sips and snacks, and meet our talented team of design experts. Check out our past events to see photos and full recaps. Wednesday, May 8, 6:30 to 8:30 p.m.
Join us for our annual salute to summer! Sway to the beat of the steel drum band while you enjoy charcuterie, cheese and oysters. Stop at the DIY mixers and muddlers lemonade bar, then watch the sunset from the rooftop while you enjoy a treat from the ice cream cart. This garden-themed soiree is the talk of the neighborhood and the perfect place to find modern furniture inspiration for your own outdoor space. Rain or shine, the party is on! Want to hear about our next event? Get on the invite list to be one of the first to know! 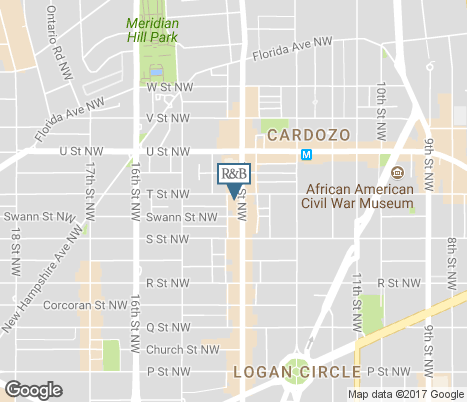 You'll find us in the Logan Circle neighborhood at 14th and T Street in the R.L. Taylor building, originally built in 1919 as a Ford Motors showroom. Our artisan-crafted furniture and home decor have filled four floors and a rooftop deck with modern design inspiration. Walk into Room & Board Washington, D.C. and you'll find a modern furniture store and expert assistance. We were named one of Washingtonian magazine's Best Home Decor Shops, a Fast Company Most Innovative Company in retail and are a proud part of the Midcity Business Improvement District, a non-profit organization dedicated to local business development. We're experts at combining the traditional architecture of D.C. with modern furnishings and often feature one-of-a-kind pieces in the store from local makers or that pay homage to the city. Enjoy three hours of free validated D.C. parking at Avenue Parking, adjacent to the store. Pick up items at your local delivery center or find your delivery rate. Monday – Friday 10 a.m. – 5 p.m.
Saturday 10 a.m. – 5 p.m.
Find open positions and learn what it's like to work at Room & Board. This section of the page contains a carousel that visually displays various linked images one at a time. For screen reader users, these images appear in a list below. Selecting the links changes the main slide visually.